Baskin Champion is an American model of Alabama native who shot to fame after being spotted out together with Justin Bieber multiple times. The two were seen at a Craig David concert at the Roxy in Los Angeles in 2018. She was recognized for her work with famous brands like Hollister, Frankies Bikinis and Show Me Your Mumu. She is also a former ‘Sports Illustrated’ Swimsuit Rookie and has modeled for Victoria’s Secret. Baskin Champion was born on 1 July 1995, in Birmingham, Alabama, United States. She is of German and English descent. 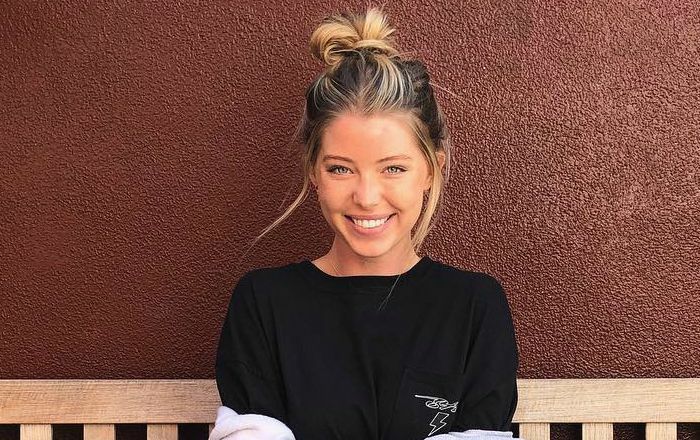 Baskin Champion attended Vestavia Hills High School and later got admission at the Auburn University to study Apparel design. Following her sophomore year, she discontinued from her studies with a focus to make a career in modeling. After the duo were spotted out many times at various places, there has been a widespread talk that blue-eyed beauty Baskin Champion and singing sensation Justin Bieber date each other. The couple were most recently seen at a SoulCycle class on Thursday, April 12. Prior to that, the two were caught spending time together in a VIP section at a Craig David concert. In addition to that, Justin has again broke out with his on and off girlfriend Selena Gomez, adding more fuel to the story. Baskin Champion is yet to make her debut in movies. Baskin debuted in the TV series, Entertainment Tonight in 2018. Francesca Paige Skin, LA Hearts Bikinis, among others. Unfortunately, there’s no information related to her net worth available at this time. Her modeling career took off at her eight grade when she represented Soca Clothing Boutiques during Birmingham Fashion Week in 2012. In 2014, Champion was crowned Miss Alabama Teen USA. Following that, she was named Miss Photogenic in the Miss Teen USA pageant 2016, which took place at the Atlantis Paradise Island Resort in Nassau, Bahamas. In 2018, Champion took part in the Sports Illustrated casting call and selected as the rookie model for their special edition. She has a pet dog named Charlie Champion, which has its own Instagram profile. Her sister Abby, who is also a model, has been dating actor Patrick Schwarzenegger, elder son of Arnold Schwarzenegger. Bieber is a close friend of Patrick and they were all attended premiere of Schwarzenegger’s upcoming movie with Bella Thorne, ‘Midnight Sun’. It is said that her sister served as a matchmaker. After the rumors of Justin dating Baskin went viral on social media, the latter was targeted by Selema Gomez fans on Instagram as they spammed the comments section with snake emojis.